The cuteness continues to build for upcoming MBC Wed-Thurs drama Shopping King Louie, a drama that didn’t land as leading man Yook Sung Jae but looks like it got an equally perfect casting with Seo In Guk. Both actors have their boyish charm that can get switched on for arrogance as needed, and in this role as the titular shopping king rich boy Louie, Seo In Guk will be playing both sides of the personalities from before and after he loses his memory and goes from riches to rags. 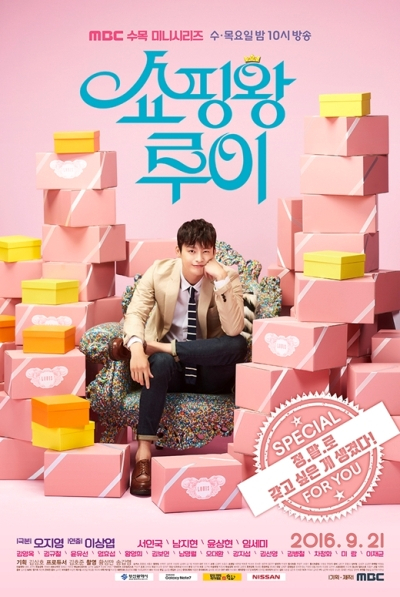 The drama posters play up the confectionary aspect of this drama, like bon bon treats with the predominately pink color scheme with splashes of lavender and blues. If it really is an airy romantic treat then I’m all in even if the story feels like a twist on Brilliant Legacy/Shining Inheritance mashed with Nam Ji Hyun‘s last drama performance of the big hearted country girl in What’s With This Family. So far downtrodden Seo In Guk is beyond adorable and Nam Ji Hyun continues to own the provincial fish out of water in the big city trope. I am looking forward to this. I don’t think I would be interested if SiG wasn’t in it, but he usually has a good hand in picking dramas. I didn’t watch his Sageuk and didn’t like the romance in King of High School, because of the leading lady. Not the actress, but the character. Other than that highly entertaining. But SiG is always all in and I loved Reply 1997, I remember you and Squad 38. The second male lead looks so out of place! Old and worn out. Not handsome either. But he’s Oska! I actually quite like Yoon Sang Hyun. Not so much that mustache he’s got going on though, yikes! Lmao I don’t think you know what old and worn out looks like. Unfortunately, they did dress him up in a laughable way for a man of his age and stature in the promo pics and I’m a bit embarrassed for him. Also his hairstyle is awful. Osaka does not deserve this. Hopefully that’s not what his styling will be like in the drama. I’m sorry but why is Yook Sung Jae having all these main roles thrown at him? He was also considered for the main lead in Moonlight! Not saying he’s a terrible actor but he’s just not there yet and it’s crazy that these casting directors don’t seem to care about that but what’s new. He seems to have turned both down so at least, he and/or his mgmt. are fully aware of that. Ugh I don’t really like the female lead’s acting but will watch for my SIG and I at least hope they have chemistry. I’m laughing so hard with all your comment about second lead almost lost my balance sitting on my chair….I can’t wait to watch this drama, everything SIG does it’s entertaining, I just can’t get enough of him! the more I look at the posters, the more I am disturbed by them. they are objectifying people, a girl in a shopping cart like she is something you can buy draws a parallel to human trafficking. it is the last thing I wanted to think about, but I do. and people in barbie boxes? packaging, superficial beauty over content? don´t like it. Not really feeling this one…. Especially the cast. I like SIG but may have to pass this one.